Includes: Teensy 3.2, audio adaptor, 14x1D headers, breadboard, 25K pot, microphone, SD card pre-loaded with sound files, 3 pushbuttons, 2 sturdy pots, wires installed in the breadboard, and extra wires (not shown here) for the TFT display. The Teensy, audio adaptor, microphone and pots are fully assembled, so no soldering is needed. We fully test this kit before shipping, so you can start the tutorial with known-good hardware. Does not include: TFT display, USB Micro-B cable, headphones, printed manual. Download this PDF manual and print for easy reference while doing the tutorial. Some basic experience with Arduino is recommended. No programming skill is assumed. 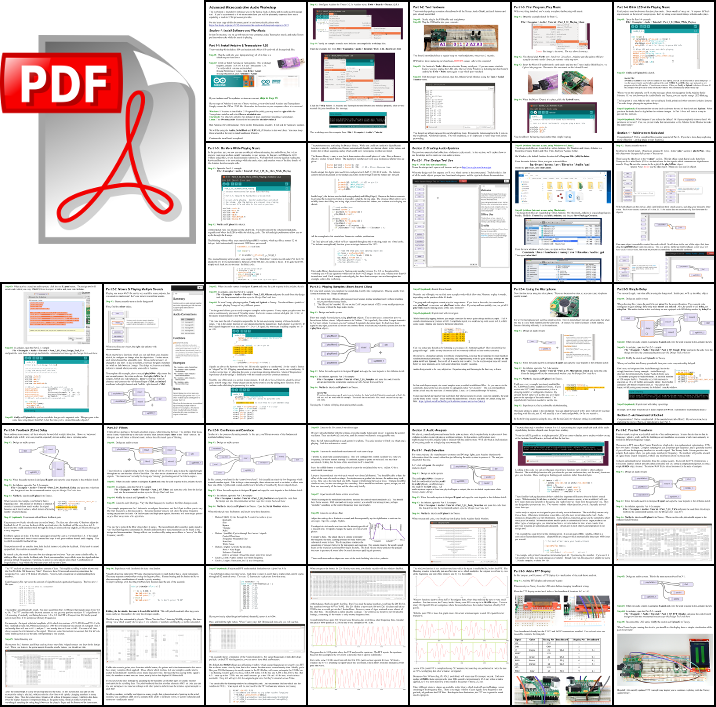 Typically 3 to 5 hours are needed to complete all this tutorial material, depending on Arduino experience and how much of the optional extra material and experimentation is pursued. If you have only a Teensy 3.x board but not audio shield, see this forum thread about doing the tutorial without the audio shield. We recorded this demo of all the tutorial material. You can see every step quickly. Like a video game walkthrough, you can still learn and experience so much more from actual hands-on experience. Alex Glow at Hackster.io recorded all the tutorial material live and unrehearsed. Alex's virtual workshop videos can give you a very authentic look at this tutorial experience.